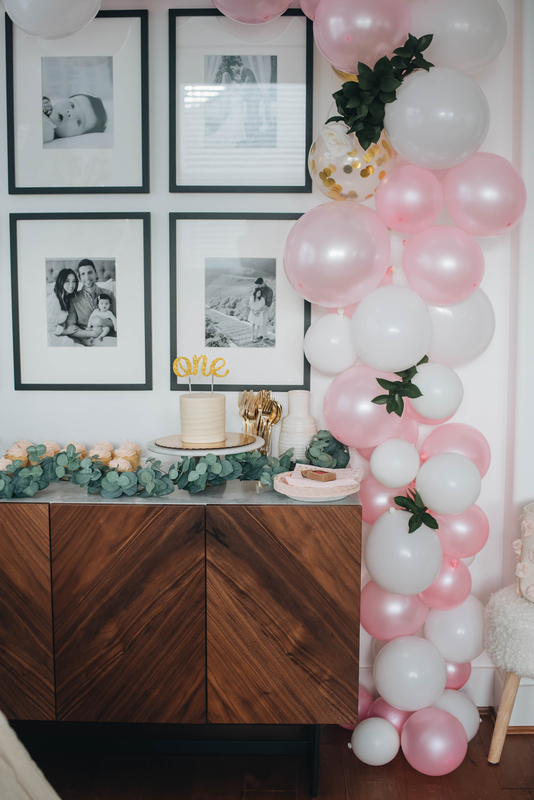 I shared all the photos from Harper’s 1st birthday party a couple weeks ago (here), but today I wanted to talk about how we created her DIY balloon garland. I received a TON of questions on Stories, so I’m going to share what tutorial we used, what went wrong, and tips for anyone who’s interested in doing it themselves. First of all, let me just say, the whole birthday party was planned last minute. 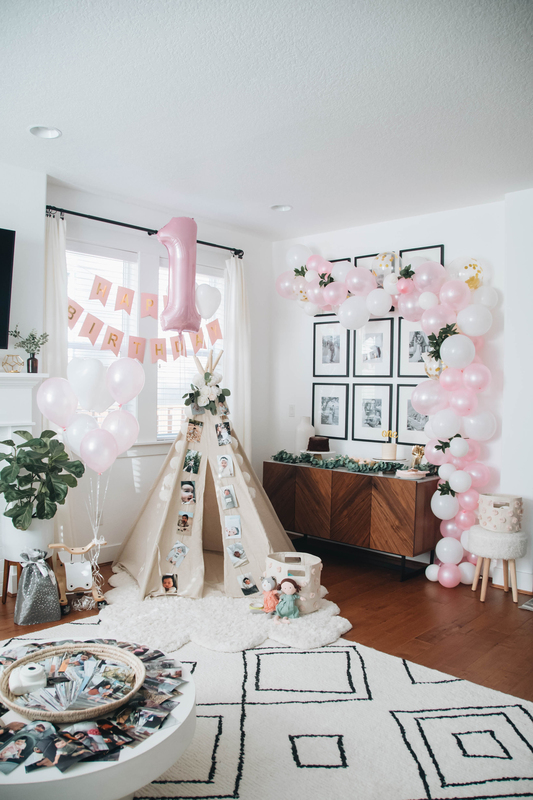 It took us maybe 5 hours to do the balloon garland, but this has a lot do with having family over and being side tracked with a baby. If you block out time and have a few helping hands, you can knock this out in a couple of hours. Keep in mind, the size of the garland will play a major role in how long it takes. We used this balloon tutorial and bought everything they recommended. The 2 major issues we ran into – the hot glue gun I bought was too hot even on the low setting, which popped A LOT of balloons. I highly recommend getting a $2 low-heat glue gun (nothing fancy). We ended up using double sided tape for the rest of the filler balloons, which worked, but wasn’t the best. We also didn’t put enough balloons on the fish wire to start. This made filling in balloons a lot more tedious. We also moved the whole garland around a few times which shifted the balloons making some of the lips of the balloons show (where you blow up the balloons). Something to also keep in mind as your attaching all your balloons. Measure out fish wire to the length you want the garland. Lay fish wire on the floor and start stringing them with balloons of different sizes – keep these fairly big because you fill in with smaller balloons. Also, make sure your fishing wire doesn’t get tangled. You want to string as many balloons as you can – this is where we made the mistake. 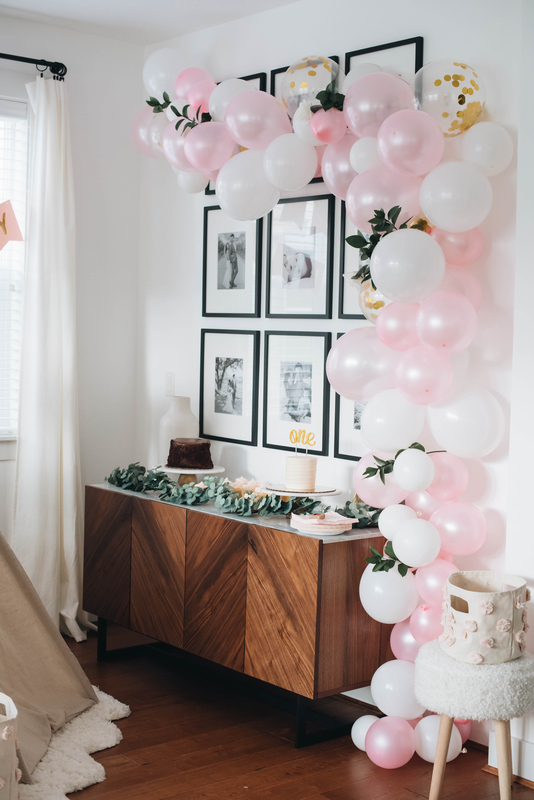 Hold balloon garland up the way you want it strung – visualize it before placing the 3M sticky hooks. Place sticky hooks onto the wall and place the fish wire on them to hang. Start filling in the garland where there’s open spaces and to make it the desired shape you want it. Because the balloons aren’t as close together has we would have liked, we weren’t able to place the greenery on the balloons that well. They’re literally laying in place. If the balloons are tighter together, you can squeeze the stems of the greenery in little gaps and they will be more secure. Put as many large balloons on the fish wire to start. Get a very cheap low-heat glue gun. Pick up some double-sided tape as backup. Recruit family members or friends to help blow up balloons. Get 2-3 balloon pumps (very inexpensive). I hope this helps! Leave me comments below if you have any other questions. This was definitely one of the easier DIY’s we’ve done. Trust me, I’ve put Mike to work on some hard ones in the past, lol. Omg this is so cute!! 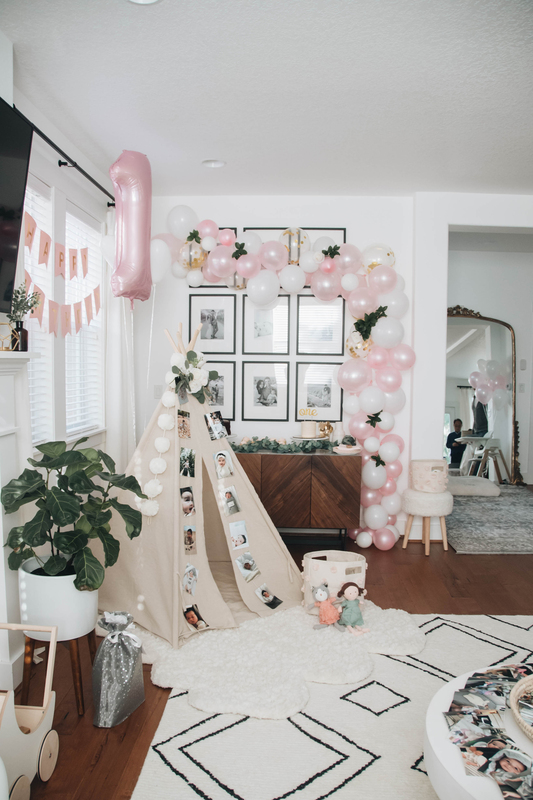 I’ve always wanted to do a balloon garland! Thanks for sharing how you made it and tips to make the process better!